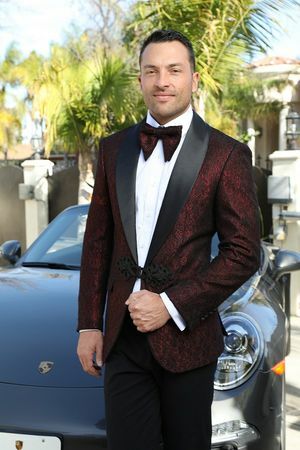 If you're going to wear a fancy dinner blazer, there is no reason not to consider the fine styles that Manzini produces. Manzini blazers are designed in Italy and designed for the man who loves his stylish blazers. This classy red woven designer blazer features a classic style that you'll love to wear with your designer jeans or dressed up like tuxedo if you're so inclined. Featuring side vents in the back.